Hire the top 3% of freelance big data architects. Toptal is a marketplace for top big data architects. Top companies and start-ups choose Toptal big data freelancers for their mission-critical software projects. Big data is an extremely broad domain, typically addressed by a hybrid team of data scientists, software engineers, and statisticians. Real expertise in big data therefore requires far more than learning the ins and outs of a particular technology. This guide offers a sampling of effective questions to help evaluate the breadth and depth of a candidate's mastery of this complex domain. 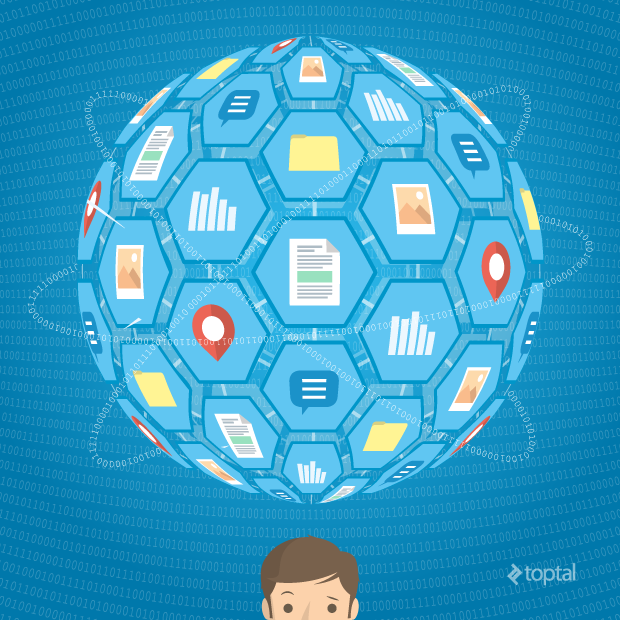 Toptal is a marketplace for top big data architects. Top companies and start-ups choose Toptal freelancers for their mission-critical software projects. James is a results-driven, can-do, and entrepreneurial engineer with eight years of C-level experience (15+ years of professional engineering)—consistently delivering successful bleeding-edge products to support business goals. He's an architect in innovative tech initiatives that add to and accelerate business revenue streams. He's also the CTO and lead developer of Toon Goggles—an SVOD/AVOD kids' entertainment service with 8 million users. Ioana is an experienced software engineer with a Master of Science degree in Artificial Intelligence. She has experience with J2SE, Ruby on Rails, Python, Flask, and Django. She is passionate about machine learning, natural language processing, and semantic analysis; analytical by nature, she is a dedicated problem solver. Reuben is an experienced software architect and engineer with significant technical and project management experience. He boasts expertise in big data, data warehousing, and scalable and distributed applications. He excels with Java, relational and NoSQL databases, and web technologies. After finishing his PhD in artificial intelligence (general game play) at the University of Dresden, Germany, Daniel founded a company in Luxembourg for automatic timeseries forecasts. Since 2014, he's been working as an independent consultant. His projects are mostly applications of data science with the occasional development of a company's MVP. Daniel has a strong background in math and statistics. Big Data Algorithms, Techniques, and Approaches: Geared primarily toward data scientists and statisticians. Big Data Technologies: Geared primarily toward software engineers. This guide highlights questions related to key concepts, paradigms, and technologies in which a big data expert can be expected to have proficiency. Bear in mind, though, that not every “A” candidate will be able to answer them all, nor does answering them all guarantee an “A” candidate. Ultimately, effective interviewing and hiring is as much of an art as it is a science. When it comes to big data, fundamental knowledge of relevant algorithms, techniques, and approaches is essential. Generally speaking, mastering these areas requires more time and skill than becoming an expert with a specific set of software languages or tools. As such, software engineers who do have expertise in these areas are both hard to find and extremely valuable to your team. The questions that follow can be helpful in gauging such expertise. Q: Given a stream of data of unknown length, and a requirement to create a sample of a fixed size, how might you perform a simple random sample across the entire dataset? (i.e., given N elements in a data stream, how can you produce a sample of k elements, where N > k, whereby every element has a 1/N chance of being included in the sample? One of the effective algorithms for addressing this is known as Reservoir Sampling. Create an array of size k.
Fill the array with the first k elements from the stream. For each subsequent element E (with index i) read from the stream, generate a random number j between 0 and i. If j is less than k, replace the jth element in the array with E.
This approach gives each element in the stream the same probability of appearing in the output sample. Q: Describe and compare some of the more common algorithms and techniques for cluster analysis. Bioinformatics: Organizing genes into clusters by analyzing similarity of gene expression patterns. Marketing: Discovering distinct groups of customers and the using this knowledge to structure a campaign that targets the right marketing segments. Insurance: Identifying categories of insurance holders that have a high average claim cost. Clustering algorithms can be logically categorized based on their underlying cluster model as summarized in the table below. Clustering can be agglomerative (starting with single elements, aggregating them into clusters) or divisive (starting with the complete dataset, dividing it into partitions). Clusters are represented by a central vector, which is not necessarily a member of the set. When the number of clusters is fixed to K, K-means clustering gives a formal definition as an optimization problem: find the K cluster centers and assign the objects to the nearest cluster center, such that the squared distances from the cluster are minimized. Based on distribution models, clusters objects that appear to belong to the same distribution. Closely resembles the way artificial datasets are generated (i.e., by sampling random objects from a distribution). Clusters are defined as areas of higher density than the remainder of the dataset. Objects in sparse areas are usually considered to be noise and/or border points. Connects points based on distance thresholds (similar to linkage-based clustering), but only connects those that satisfy a specified density criterion. Most popular density-based clustering method is DBSCAN, which features a well-defined cluster model called "density-reachability". Q: Define and discuss ACID, BASE, and the CAP theorem. Atomicity. Requires each transaction to be “all or nothing”; i.e., if one part of the transaction fails, the entire transaction fails, and the database state is left unchanged. Consistency. Requires every transaction to bring the database from one valid state to another. Any data written to the database must be valid according to all defined rules, including (but not limited to) constraints, cascades, triggers, and any combination thereof. Isolation. Requires concurrent execution of transactions to yield a system state identical to that which would be obtained if those same transactions were executed sequentially. Durability. Requires that, once a transaction has been committed, it will remain so even in the event of power loss, crashes, or errors. Many databases rely upon locking to provide ACID capabilities. Locking means that the transaction marks the data that it accesses so that the DBMS knows not to allow other transactions to modify it until the first transaction succeeds or fails. An alternative to locking is multiversion concurrency control in which the database provides each reading transaction the prior, unmodified version of data that is being modified by another active transaction. Guaranteeing ACID properties in a distributed transaction across a distributed database where no single node is responsible for all data affecting a transaction presents additional complications. Network connections might fail, or one node might successfully complete its part of the transaction and then be required to roll back its changes, because of a failure on another node. The two-phase commit protocol (not to be confused with two-phase locking) provides atomicity for distributed transactions to ensure that each participant in the transaction agrees on whether the transaction should be committed or not. In contrast to ACID (and its immediate-consistency-centric approach), BASE (Basically Available, Soft State, Eventual Consistency) favors availability over consistency of operations. BASE was developed as an alternative for producing more scalable and affordable data architectures. Allowing less constantly updated data gives developers the freedom to build other efficiencies into the overall system. In BASE, engineers embrace the idea that data has the flexibility to be “eventually” updated, resolved or made consistent, rather than instantly resolved. The Eventual Consistency model employed by BASE informally guarantees that, if no new updates are made to a given data item, eventually all accesses to that item will return the last updated value. A system that has achieved eventual consistency is often said to have converged, or achieved replica convergence. Eventual consistency is sometimes criticized as increasing the complexity of distributed software applications. In the decade since its introduction, designers and researchers have used the CAP theorem as a reason to explore a wide variety of novel distributed systems. The CAP Theorem has therefore certainly proven useful, fostering much discussion, debate, and creative approaches to addressing tradeoffs, some of which have even yielded new systems and technologies. Yet at the same time, the “2 out of 3” constraint does somewhat oversimplify the tensions between the three properties. By explicitly handling partitions, for example, designers can optimize consistency and availability, thereby achieving some trade-off of all three. Although designers do need to choose between consistency and availability when partitions are present, there is an incredible range of flexibility for handling partitions and recovering from them. Aspects of the CAP theorem are often misunderstood, particularly the scope of availability and consistency, which can lead to undesirable results. If users cannot reach the service at all, there is no choice between C and A except when part of the service runs on the client. This exception, commonly known as disconnected operation or offline mode, is becoming increasingly important. Some HTML5 feature make disconnected operation easier going forward. These systems normally choose A over C and thus must recover from long partitions. Q: What is dimensionality reduction and how is it relevant to processing big data? Name some techniques commonly employed for dimensionality reduction. Dimensionality reduction is the process of converting data of very high dimensionality into data of lower dimensionality, typically for purposes such as visualization (i.e, projection onto a 2D or 3D space for visualization purposes), compression (for efficient storage and retrieval), or noise removal. Note: Each of the techniques listed above is itself a complex topic, so each is provided as a hyperlink to further information for those interested in learning more. Q: Discuss some common statistical sampling techniques, including their strengths and weaknesses. When analyzing big data, processing the entire dataset would often be operationally untenable. Exploring a representative sample is easier, more efficient, and can in many cases be nearly as accurate as exploring the entire dataset. The table below describes some of the statistical sampling techniques that are more commonly used with big data. Q: Explain the term “cache oblivious”. Discuss some of its advantages and disadvantages in the context of processing big data. A cache oblivious (a.k.a., cache transcendent) algorithm is designed to take advantage of a CPU cache without knowing its size. Its goal is to perform well – without modification or tuning – on machines with different cache sizes, or for a memory hierarchy whose levels are of different cache sizes. Typically, a cache oblivious algorithm employs a recursive divide and conquer approach, whereby the problem is divided into smaller and smaller sub-problems, until a sub-problem size is reached that fits into the available cache. For example, an optimal cache oblivious matrix multiplication is obtained by recursively dividing each matrix into four sub-matrices to be multiplied. In tuning for a specific machine, one may use a hybrid algorithm which uses blocking tuned for the specific cache sizes at the bottom level, but otherwise uses the cache-oblivious algorithm. The ability to perform well, independent of cache size and without cache-size-specific tuning, is the primary advantage of the cache oblivious approach. However, it is important to acknowledge that this lack of any cache-size-specific tuning also means that a cache oblivious algorithm may not perform as well as a cache-aware algorithm (i.e., an algorithm tuned to a specific cache size). Another disadvantage of the cache oblivious approach is that it typically increases the memory footprint of the data structure, which may further degrade performance. Interestingly though, in practice, performance of cache oblivious algorithms are often surprisingly comparable to that of cache aware algorithms, making them that much more interesting and relevant for big data processing. These days, it’s not only about finding a single tool to get the job done; rather, it’s about building a scalable architecture to effectively collect, process, and query enormous volumes of data. Armed with a strong foundational knowledge of big data algorithms, techniques, and approaches, a big data expert will be able to employ tools from a growing landscape of technologies that can be used to exploit big data to extract actionable information. The questions that follow can help evaluate this dimension of a candidate’s expertise. Q: What is Hadoop? What are its key features? What modules does it consist of? Apache Hadoop is a software framework that allows for the distributed processing of large datasets across clusters of computers. It is designed to effectively scale from single servers to thousands of machines, each offering local computation and storage. Rather than relying on hardware to deliver high-availability, the library itself is designed to detect and handle failures at the application layer. 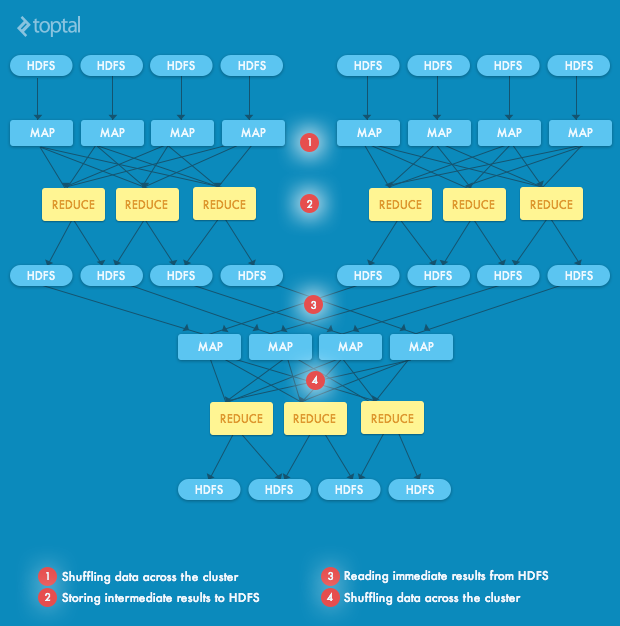 Hadoop MapReduce: A system for parallel processing of large datasets. Q: Provide an overview of HDFS, including a description of an HDFS cluster and its components. HDFS is a highly fault-tolerant distributed filesystem, commonly used as a source and output of data in Hadoop jobs. It builds on a simple coherence model of write-once-read-many (with append possible) access. It supports a traditional hierarchical organization of directories and files. It’s important to note that HDFS is meant to handle large files, with the default block size being 128 MB. This means that, for example, a 1 GB file will be split into just 8 blocks. On the other hand, a file that’s just 1 KB will still take a full 128 MB block. Selecting a block size that will optimize performance for a cluster can be a challenge and there is no “one-size-fits-all” answer in this regard. Setting block size to too small value might increase network traffic and put huge overhead on the NameNode, which processes each request and locates each block. Setting it to too large a value, on the other hand, might result in a great deal of wasted space. Since the focus of HDFS is on large files, one strategy could be to combine small files into larger ones, if possible. Q: Provide an overview of MapReduce, including a discussion of its key components, features, and benefits. MapReduce is a programming model and an associated implementation for processing and generating large datasets with a parallel, distributed algorithm on a cluster. A MapReduce program is composed of a Map() procedure that performs filtering and sorting and a Reduce() procedure that performs a summary (i.e., data reduction) operation. A MapReduce system orchestrates the processing by marshalling the distributed servers, running the various tasks in parallel, managing all communications and data transfers between the various parts of the system, and providing for redundancy and fault tolerance. Reduce step: The master node collects the answers from its worker nodes and combines them to form its output (i.e., the answer to the problem it was tasked with solving). 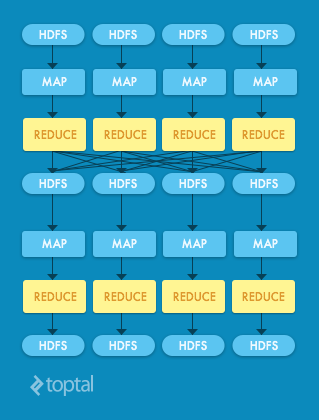 MapReduce allows for distributed processing of the map and reduction operations. Provided that each mapping operation is independent of the others, all maps can be performed in parallel (though in practice this is limited by the number of independent data sources and/or the number of CPUs near each source). Similarly, a set of ‘reducers’ can perform the reduction phase, provided that all outputs of the map operation that share the same key are presented to the same reducer at the same time, or that the reduction function is associative. While this process can often appear inefficient compared to algorithms that are more sequential, MapReduce can be applied to significantly larger datasets than high performance servers can usually handle (e.g., a large server farm of “commodity” machines can use MapReduce to sort a petabyte of data in only a few hours). The parallelism in MapReduce also helps facilitate recovery from a partial failure of servers or storage during the operation (i.e., if one mapper or reducer fails, the work can be rescheduled, assuming the input data is still available). This is particularly important, since the failure of single nodes are fairly common in multi-machine clusters. When there are thousands of disks spinning for a couple of hours, it’s not unlikely that one or two of them will fail at some point. The key contributions of the MapReduce framework are not the map and reduce functions per se, but the scalability and fault-tolerance achieved for a variety of applications. It should be noted that a single-threaded implementation of MapReduce will usually not be faster than a traditional implementation. Its benefits are typically only realized when the optimized distributed shuffle operation (which reduces network communication cost) and fault tolerant features of the framework come into play. As a side note, the name MapReduce originally referred to a proprietary Google technology but has since been genericized. Q: Describe the MapReduce process in detail. While not all big data software engineers will be familiar with the the internals of the MapReduce process, those who are will be that much better equipped to leverage its capabilities and to thereby architect and design an optimal solution. The local Job Client prepares the job for the submission and sends it to Resource Manager (MR2) or Job Tracker (MR1). Resource Manager (MR2) / Job Tracker (MR1) schedules the job across the cluster. In the case of MR2, the Application Master is started, which will take care of managing the job and terminating it after of completion. The job is sent to Node Managers (MR2) or Task Trackers (MR1). An InputSplitter is used to distribute the map tasks across the cluster in the most efficient way. Each of the Note Managers (MR2) / Task Trackers (MR1) spawns a map task, sending progress updates to an Application Master (MR2) / Job Tracker (MR1). The output is partitioned, according to the reducers it needs to go to. An optional Combiner might be used as well to join values for the same local key. If a map fails, it is retried (up to a defined maximum number of retries). After a map succeeds, the local partitions with the output can be copied to respective reduce nodes (depending on the partition). After a reduce task receives all relevant files, it starts a sort phase, in which it merges the map outputs, maintaining the natural order of keys. For each of the keys in the sorted output, a reduce function is invoked and the output is stored to the desired sink (in our case, HDFS). Since the node where it’s being executed is usually also a DataNode, the first replica is written to the local disk. If a reducer fails, it is run again. After a successful chain of operations, temporary files are removed and the Application Master closes gracefully. Q: What are major types of NoSQL databases commonly used for big data? In recent years, the growing prevalence and relevance of big data has dramatically increased the need to store and process huge quantities of data. This has caused a shift away from more traditional relational database systems to other approaches and technologies, commonly known as NoSQL databases. NoSQL databases are typically simpler than traditional SQL databases and typically lack ACID transactions capabilities, thereby making them more efficient and scalable. The taxonomy of such databases might be created using a couple of different spaces. Although the table below groups them by data model, in the context of big data, consistency model would be another pivotal feature to consider when evaluating options for these types of datastores. One of the simplest approaches for keeping data is just to use a hierarchical filesystem. It's extremely simple, and is also often very efficient. Represents data as a collection of key-value pairs. More complex data models might be implemented on a top of such a structure. Inspired by Google's BigTable publication, stores data in records that are able to store anvery large number of dynamic columns. In general, describe data using somewhat loose schema - defining tables and the main columns (e.g. ColumnFamilies in case of HBase) and being flexible regarding the data stored inside them, which are key-values. Designed around the concept of a "document"; i.e., a single object encapsulating data in some standard format (such as JSON, XML, etc.). Instead of tables with rows, operates on collections of documents. Q: What are Pig, Hive, and Impala? What are the differences between them? Pig, Hive, and Impala are examples of big data frameworks for querying and processing data in the Apache Hadoop ecosystem. While a number of other systems have recently been introduced (notable mentions include Facebook’s Presto or Spark SQL), these are still considered “the big 3” when dealing with big data challenges. The table below provides a basic description and comparison of the three. Introduced in 2006 by Yahoo Research. Ad-hoc way of creating and executing map-reduce jobs on a very large datasets Introduced in 2007 by Facebook. Peta-byte scale data warehousing framework. Introduced in 2012 by Cloudera. Massively parallel processing SQL query engine on HDFS. Q: What are Apache Tez and Apache Spark? What kind of problems do they solve (and how)? One issue with MapReduce is that it’s not suited for interactive processing. Moreover, stacking one MapReduce job over another (which is a common real-world use case when running, for example, Pig or Hive queries) is typically quite ineffective. After each stage, the intermediate result is stored to HDFS, only to be picked up as an input by another job, and so on. It also requires a lot of shuffling of data during the reduce phases. While sometimes it is indeed necessary, in many cases the actual flow could be optimized, as some of the jobs could be joined together or could use some cache that would reduce the need of joins and in effect increase the speed significantly. Addressing these issues was one of important reasons behind creating Apache Tez and Apache Spark. They both generalize the MapReduce paradigm and execute the overall job by first defining the flow using a Direct Acyclic Graph (DAG). At a high level of abstraction, each vertex is a user operation (i.e., performing some form of processing on the input data), while each edge defines the relation with other steps of the overall job (such as grouping, filtering, counting, and so on). Based on the specified DAG, the scheduler can decide which steps can be executed together (and when) and which require pushing the data over the cluster. Additionally, both Tez and Spark offer forms of caching, minimizing the need to push huge datasets between the nodes. There are some significant differences between the two technologies though. Apache Tez was created more as an additional element of Hadoop ecosystem, taking advantage of YARN and allowing to easily include it in existing MapReduce solutions. It can even be easily run with regular MapReduce jobs. Apache Spark, on the other hand, was built more as a new approach to processing big data. It adds some new concepts, such as RDDs (Resilient Distributed Datasets), provides a well-thought-out idiomatic API for defining the steps of the job (which has many more operations than just map or reduce, such as joins or co-groups), and has multiple cache-related features. The code is lazily evaluated and the Direct Acyclic Graph is created and optimized automatically (in contrast, in the case of Tez, the graph must be defined manually). Taking all of this into account, the code in Spark tends to be very concise. Spark is also a significant part of the Berkeley Data Analytics Stack (BDAS). Q: What is a column-oriented database? When and why would you use one? Column-oriented databases arrange data storage on disk by column, rather than by row, which allows more efficient disk seeks for particular operations. This has a number of benefits when working with large datasets, including faster aggregation related queries, efficient compression of data, and optimized updating of values in a specific column across all (or many) rows. Whether or not a column-oriented database will be more efficient in operation varies in practice. It would appear that operations that retrieve data for objects would be slower, requiring numerous disk operations to collect data from multiple columns to build up the record. However, these whole-row operations are generally rare. In the majority of cases, only a limited subset of data is retrieved. In a rolodex application, for instance, operations collecting the first and last names from many rows in order to build a list of contacts are far more common than operations reading all data for a single entity in the rolodex. This is even more true for writing data into the database, especially if the data tends to be “sparse” with many optional columns. It is also the case that data organized by columns, being coherent, tends to compress very well. For these reasons, column stores have demonstrated excellent real-world performance in spite of any theoretical disadvantages. Q: What is a Lambda Architecture and how might it be used to perform analytics on streams with real-time updates? One of the common use cases for big data is real-time processing of huge volumes of incoming data streams. Depending on the actual problem and the nature of the data, multiple solutions might be proposed. In general, a Lambda Architecture approach is often an effective way to address this type of challenge. The core concept is that the result is always a function of input data (lambda). The final solution should work as such a lambda function, irrelevant of the amount of data it has to process. To make this possible, the data is split into two parts; namely, raw data (which never changes and might be only appended) and pre-computed data. The pre-computed data is further subdivided into two other groups; namely, the old data and the recent data (where “old” and “recent” are relative terms, the specifics of which depend on the operational context). Batch layer. Manages the master dataset (an immutable, append-only set of raw data) and pre-computes arbitrary query functions (called batch views). Serving layer. 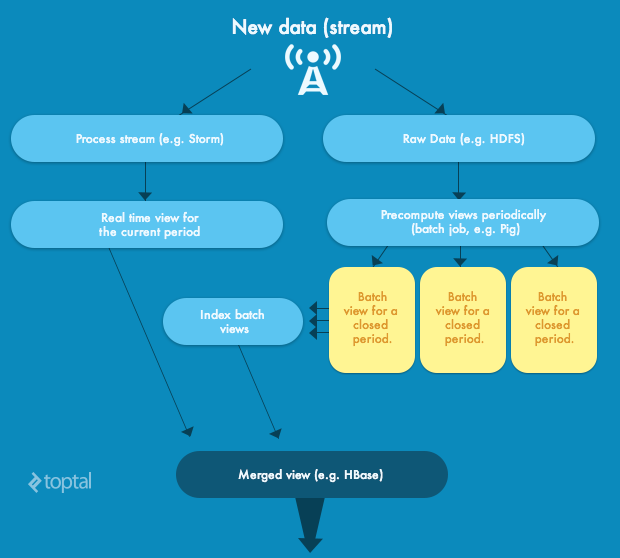 Indexes the batch views to support ad-hoc queries with low latency. Speed layer. Accommodates all requests that are subject to low latency requirements. Using fast and incremental algorithms, the speed layer deals with recent data only. There are many tools that can be applied to each of these architectural layers. For instance, the raw results could simply be stored in HDFS and the batch views might be pre-computed with help of Pig jobs. Similarly, to make it possible to query batch views effectively, they might be indexed using technologies such as Apache Drill, Impala, ElasticSearch or many others. The speed layer, though, often requires a non-trivial amount of effort. Fortunately, there are many new technologies that can help with that as well. One of the most commonly chosen ones is Apache Storm which uses an abstraction of spouts and bolts to define data sources and manipulations of them, allowing distributed processing of streaming data. The final element is to combine the results of the Speed layer and the Serving layer when assembling the query response. This architecture combines the batch processing power of Hadoop with real-time availability of results. If the underlying algorithm ever changes, it’s very easy to just recalculate all batch views as a batch process and then update the speed layer to take the new version into account. Without a doubt, big data represents one of the most formidable and pervasive challenges facing the software industry today. From social networking, to marketing, to security and law enforcement, the need for solutions that can effectively handle and process big data is becoming increasingly important and is rapidly on the rise. Real expertise and proficiency in this domain requires far more than learning the ins and outs of a particular technology. It requires an understanding, at the first principles level, of the manifold technical challenges and complexities involved as well as the most effective methodologies and approaches to address these hurdles. We hope you find the questions presented in this article to be a useful foundation for “separating the wheat from the chaff” in your quest for the elite few among Big Data engineers.